www.sportseventsmagazine.com June 2018 37 program, a single-year high mark since the program was first offered," Whitemarsh said. "That year delivered another import- ant milestone as all 50 states now have high school football programs enrolled in the program as well, including more than 60 of the nation's largest school districts such as New York City, Los Angeles and Chicago." Another step the organization has taken to make the gridiron safer is Rookie Tackle. Piloted last year, Rookie Tackle aims to bridge flag and 11-player tackle. It's focused on skill development, and game play takes place in a fun, innovative and controlled environment. It's also played on a smaller field with few players, creating a greater coach-to-player ratio, and removes special teams to encourage more plays from scrimmage, player rotations to learn multiple positions and no blitzing to help all players gain passing game skills. The 2017 pilot of the program was so success- ful that in 2018 USA Football is offering leagues nationwide the opportunity to adapt Rookie Tackle, strengthening the sport's player pathway through football's ADM of flag, Rookie Tackle and 11-player. "Pop Warner, the largest youth football league operating organization in the country, has endorsed and will offer USA Football's American Development Model this year, the first national implementation of the U.S. Olympic Committee-backed program for the sport," Whitemarsh said. The most recent safety change USA Football made is the introduction this year of Tip of the Spear Contact System. Created by former NFL offensive lineman Scott Peters, the Tip of the Spear Contact System is a contemporary all-position-rel- evant approach to teach technique and skills through smarter play. The system emphasizes use of the hands – not the hel- met – when engaging an opponent. Teams participating in the system can receive customized training for their program, and that includes both on-field, interactive instruction of the contact system tech- niques and innovative approaches to skill development. "Peters has taught Tip of the Spear to more than 50 college and profes- sional teams, in addition to youth and high school programs, and serves as its chief instructor for USA Football," Whitemarsh said. "Additionally, USA Football has introduced its leadership development training program for coaches and adminis- trators by partnering with industry leader Focus 3 and its CEO Brian Kight. Through our partnership – and for the first time ever – coaches can learn and install the same leadership training and culture-building programs used by the best coaches in the sport across the NFL, college and high school." Further aiding the networking of coaches, USA Football conducts hundreds of clinics each year throughout the country, addressing things such as coach certifica- tion, game play and education. "We train more high school and youth coaches com- bined than any organization in the United States," Whitemarsh said. "Our annual National Conference, traditionally held in January in Orlando, Florida, is the largest annual gathering of high school and youth football leaders nationwide. The three-day education-based conference also is an ex- traordinary networking event, connecting coaches from coast-to-coast for three days of professional development." On each level of the game – whether it' s player development, coaching education or safety – organizations such as USA Football and American Youth Football are continuing to work to advance the sport. They strive to do so by setting important standards and best practices to strengthen both coaches and players on the gridiron, which can continue to help illustrate the many benefits to participating in the team sport. "Football offers a great way for kids to be physically active while acquiring social benefits that come with sports par- ticipation," said Whitemarsh. "Team sports help our children gain self-confidence, teamwork and an important sense of com- munity while making lasting friendships. Football is an exceptional way for kids to have fun and to help foster important development as they grow older." 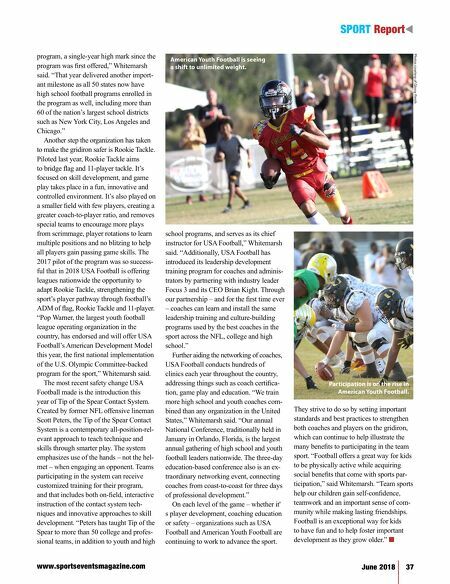 n t SPORT Report Photos courtesy of Glossy Finish American Youth Football is seeing a shift to unlimited weight. Participation is on the rise in American Youth Football.